The following foods usually contain large amounts of salt. Try to avoid them or consume only small quantities. You can find some very low-sodium alternatives (35mg or less) in our Low Salt Brands section. For a complete listing of products with 140mg or less sodium, get a copy of the Pocket Guide to Low Sodium Foods. Eliminate the saltshaker. Don’t salt before you taste. Break the habit of automatically reaching for the saltshaker. Use less salt in cooking. In most recipes salt can be reduced or, in many cases, omitted without compromising the flavor. Use more herbs and spices, particularly onion and garlic powder. Also, low-sodium bouillon can add extra flavor, as can wine, vinegar, lemon or lime juice. Prepare low-salt recipes. Get a good low-sodium cookbook, such as The Hasty Gourmet™ Low-Salt Favorites. Or try out one of the low-salt recipes at this site or search the Internet where you’ll find an abundance of recipes. Eat more fruits and vegetables. Use less prepared foods – the less processing, the less sodium. Choose lower sodium prepared foods. Look for items labeled sodium free, low sodium, reduced sodium, unsalted, and no salt added. Read the label. 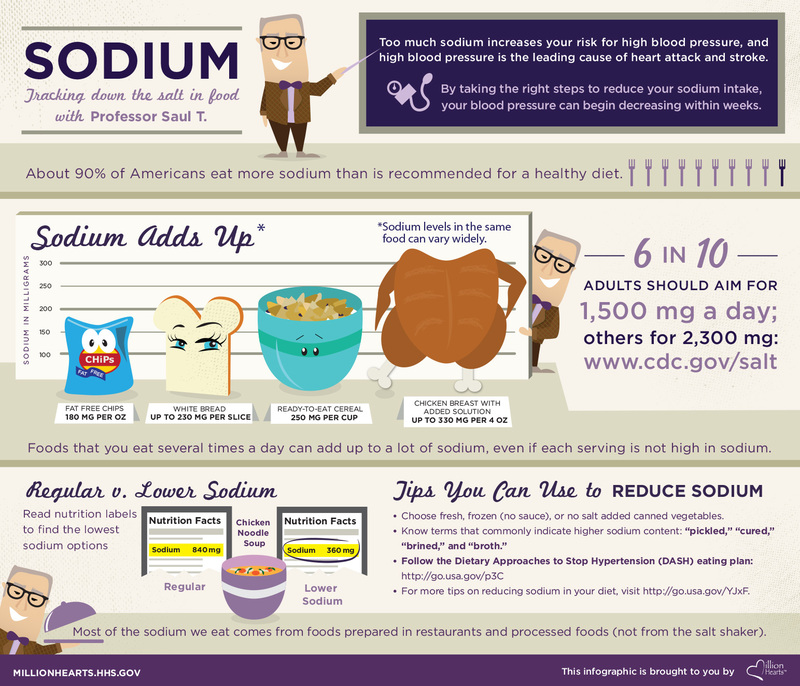 Know how much sodium is in each serving. If the label says 150mg sodium per 1/4 cup and you eat 1/2 cup, you’re consuming twice as much. Be alert to “salty” terms, like brine, cured, marinated, pickled, and smoked. Order low-sodium foods. Ask how foods are prepared; choose grilled or roasted entrees and items without sauces. Avoid soups. Most are loaded with sodium and can exceed 1,000mg per serving. Use oil and vinegar on salads. Stay away from creamy dressings. Avoid salads made with mayonnaise, like potato salad and coleslaw. Request condiments served on the side. Then you can control the amount to use. Ask that no salt is added to your entree. Many restaurants will accommodate your dietary restrictions. Bring your own low-sodium condiments to use. Place them in small plastic containers that you can carry with you. For additional dining out suggestions, see Dining Out for a list of the best restaurant menu choices.